Every season has its scents but those of the summer are unmistakable! The pungent smell of freshly cut grass, that of earth and moss after a summer storm … but one more than all holds the essence of this season: the smell of the sea. So dive with us in a “sea” of science! 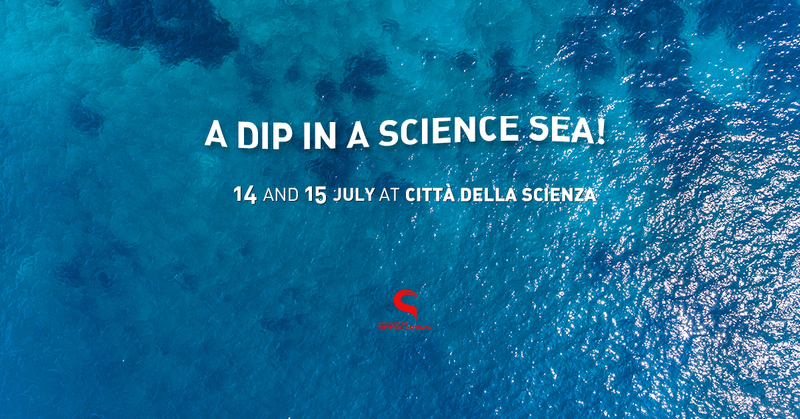 Stories, tales, games and experiments await you in Città della Scienza to celebrate the arrival of the most loved and “sweaty” season of the year! It is precisely during the summer that we often hear about perceived temperatures, thermometers, maximums, minimums … did you know that the strategies implemented by the thermos to avoid exchanging heat are the same as those used by our bodies? With “What warm!”, Through simple experiments, you will have the opportunity to find out what the temperature is, what is meant by perceived temperature and much more! Do not miss! With the heat, the answer can only be heading towards the sea! So do not miss our customized marine-themed workshops. The most classic of traditional family games: the steal-flag, revisited in a marine key. Often observing the surface of the sea rippled by the waves you can get the wrong impression that the sea is all uniform! This huge blue expanse that covers 2/3 of our planet has within it a wide range of diversified environments. Find out what they are and how all forms of marine life have adapted to these environments in “Rubabandiera Marino”. Among the many marine animals, some pass, sometimes, unnoticed! This is the case of the group of sponges, scientifically known as Porifera. How many imagine that the natural bath sponge that we use every day to wash was once a living being able to feed, grow and reproduce ?! For these and other curiosities, do not miss “Spongnes!”. Explore the exhibition areas of our Science Center! Visit the exhibition dedicated to the sea. Find out which new fish, shellfish and crustaceans live in our tanks following the guided tour “Marine Ecosystems”. During the visit, you will have the opportunity to caress some marine organisms alive in our Touch pool. What an emotion! The meeting with one of these animals can turn a pleasant and relaxing swim on an unfortunate day! These are the jellyfish, ancient inhabitants of our seas on which false information often circulates. We are here to deny you. Do not miss our study “A Jellyfish for a Friend” and you will always know how to behave correctly in his presence. For kids, “Invent your marine animals”, a laboratory where you can color fish shapes, inventing new species, and then, as for “magic”, make them appear and swim in a large virtual aquarium. “But what are the mosquitoes for ? !”: How many of us have not wondered, at least once in their lifetime, what were these “blood-thirsty” insects that disturb us on our summer nights? All living things have a fundamental ecological role in our planet, including mosquitoes. Check theirs out! Visit the exhibition dedicated to the sea! Find out which new fish, molluscs and crustaceans live in our tanks following the guided tour “Marine Ecosystems”. During the guide, you will have the opportunity to caress some marine organisms in our Touch pool. What an emotion! For the little ones, “Create your marine animals“, a laboratory where fish shapes are colored, inventing new species, and then, as for “magic”, make them appear and swim in a large virtual aquarium. BIT is back the most exhibit loved by adults and children! BIT! You do not know him? Come and meet him, he will answer all your scientific curiosities and not only … Where have you been in this time? What adventures will he tell you? Do not miss this appointment with “Talk to BIT”. Take part in the guided tour by “Bugs & CO”, the new exhibition space dedicated to the spectacular world of insects and more. For every man on Earth there are over 150 million insects. “The six-legged giants” have conquered almost all the habitats of our planet …. it’s time to start getting to know them better. In addition to guided tours to Corporea, the Interactive Exhibition of the Human Body, learn more about “The Thermodynamics of Our Body” to understand how and why our body exchanges energy with the external environment.Turning among the funniest exhibits of the Isle of the Corporea’s Thermodynamic System, you’ll see that our body functions in all respects like a thermal machine.It requires ENERGY for its operation and the relationship between energy used and time of use is called METABOLISM. Moreover the 2D show “From the Earth to the Universe – From the Earth to the Universe” to discover the most important theories elaborated by man during the time in the astronomical field up to the future perspectives, and for 3D lovers, “Robot Explorers” is waiting for you to travel together, lander and orbiter inside our solar system. A new 2D show, free for the occasion, “Microcosm- The microcosm within us”, is scheduled Saturday and Sunday where you can “miniaturize” and be catapulted into the human body to defeat a mysterious viral infection in a raceagainst time … Will the patient survive? Come and discover the rich program!